1) Introduce different notes and the concept of musical duration. Many of my beginning students are new to using notes to represent how long a sound lasts. 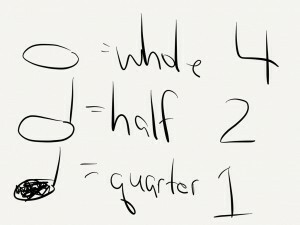 With Paper, I’m able to easily show the differences between whole, half, and quarter notes and how long each note lasts in 4/4. Sometimes, I’ll create a blank page immediately after this one and ask the students to draw the three kinds of notes themselves. 2) Sketch guitar chord chart using different colors and tools for emphasis. 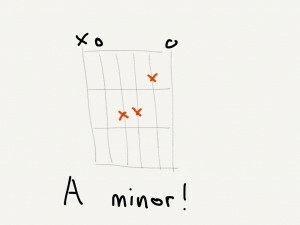 While I do use GuitarToolKit on my iPad to show chords, I also will sometimes draw chord modifications on Paper. It’s important to make sure each sketch, drawing, or notation clearly conveys what I want to express. When I’m drawing a guitar chord chart, I first draw the strings and frets using the pencil tool so the lines don’t draw focus away from the finger placements, chord name, and which strings are open and which aren’t strummed. I then switch to the marker tool for a bolder line that makes it clear where to look. A different color for the finger placements draws the eye there first. 3) Introduce the music staff and concepts of ascending or descending pitch. With Paper, it’s easy to sketch a quick music staff and use different colors to highlight notes. I drew this sketch for a student who can already recognize whole, half, quarter, and eighth notes and has an intrinsic understanding of what it means for pitches to ascend and descend. This sketch helped me take that knowledge to the next level and begin our unit on reading music notation. My student is able to easily visualize which note is the lowest, which is in the middle, and which is the highest. And with Paper’s easy rewind feature (place two fingertips on the screen and move them counterclockwise) I was able to erase the notes and write new ones in their place. 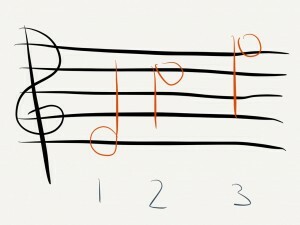 4) Notate a rhythm and indicate how to strum and count it. My guitar students learn to play a variety of different rhythms on their instrument. It doesn’t take too long for them to become comfortable with notating their own rhythms! Students select what kind of note they want for their first beat and then fill in the remaining beats with other notes of their choice. The last step is adding arrows to show a strumming pattern to use for this rhythm. Because all you need to sketch with Paper is a fingertip, students are easily able to draw. In this case, the half note was written first before my student filled the rest of the measure with eighth notes and notated how she would count the beats. 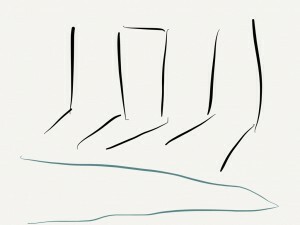 5) Use different colors to represent rhythms and dynamics in the same sketch. 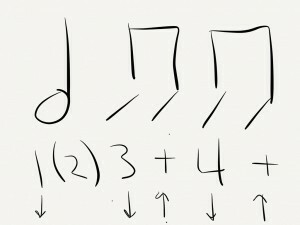 Here is another example of student rhythm notation. This time, instead of focusing on counting the rhythm and picking an accompanying strumming pattern, we discussed different options for dynamics. My student already understood the concept of piano and forte as dynamics markers, so I next introduced crescendos and decrescendos. He was easily able to indicate different types and lengths of both options for his rhythmic notation. Paper makes it easy to select a different color and add it to your sketch. I’ll continue to share my different use cases for Paper as I continue to use it with students. In the meantime, I’d love to hear how you use Paper and other note-taking, drawing, or sketching apps in your music lessons! Leave a comment and let me know what you’re up to.